These three have never met – Marian and James Payne, residing in Richmond, Virginia, and Mulanda Jimmy Juma, residing in Johannesburg, South Africa – but all began a journey toward peacebuilding a quarter of a century ago. The trails they’ve taken have intersected at multiple junctures, without their knowing it. 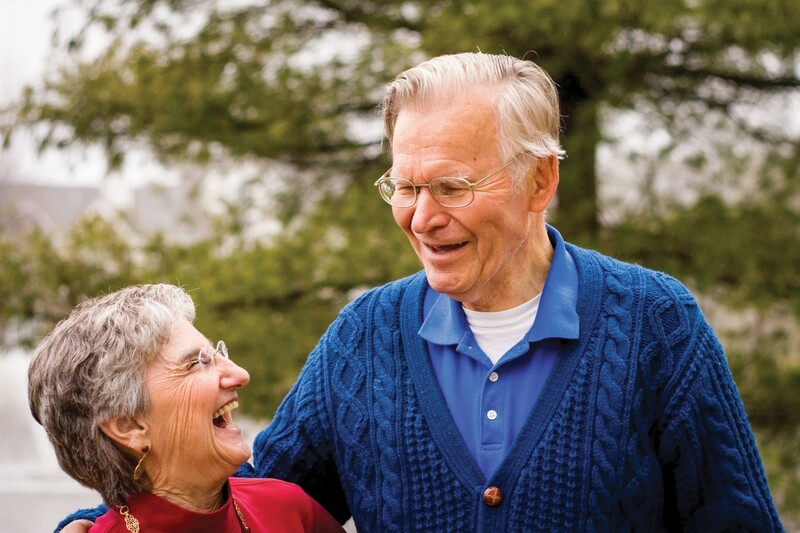 The Paynes are retired Pennsylvania educators, now in their early 80s, who chose in 1993 to be the founding donors of what is today the Center for Justice and Peacebuilding (CJP) at Eastern Mennonite University, their undergraduate alma mater. 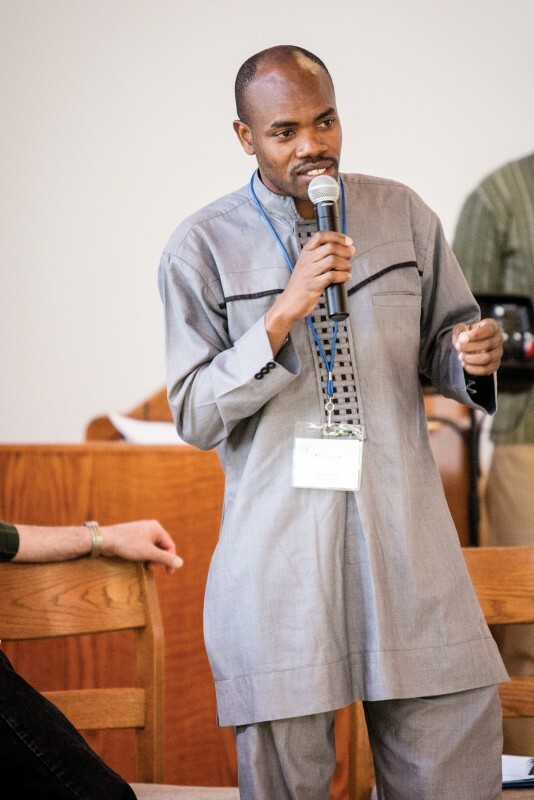 Juma, a native of the Democratic Republic of the Congo, was a 20-year-old university student in his home country when CJP held its first peacebuilding workshop in Harrisonburg, Virginia, during the summer of 1994. At age 20, Juma had already survived multiple bouts of warfare in the Great Lakes region of Africa. His father was an educated man, respected in their village – which made him and his family the target of whichever set of armed combatants were sweeping through. Juma recalls hiding at age 4 under a rock with his 6-year-old sister as they tried not to breathe, listening to soldiers calling them “insects” and hunting to shoot them. His father was imprisoned and tortured nearly to death. A sister was raped and never able to function normally again. Juma became a refugee and eventually fled his country, arriving in South Africa in 1999. Juma began corresponding with Carl Stauffer, a 1984 social work graduate of EMU, who lived in South Africa for 16 years and was MCC’s regional peace adviser for the southern Africa region from 2000 to 2009. In 2002, Stauffer arranged for MCC to give Juma a scholarship to attend the six-week training program of the Africa Peacebuilding Institute (API) in Zambia. This was also the year that Stauffer completed his master’s degree in conflict transformation at CJP and returned to teach at API. It was the third year that API was operational. API’s training materials and teaching techniques, then and now, strongly resemble those assembled in MCC’s Mediation and Facilitation Training Manual, first published in 1989 under Lederach’s co-editorship, as well as those used to this day in CJP’s courses. Juma became an API trainer while resuming collegiate studies interrupted by wars in the Congo. In 2009, when Stauffer completed his doctorate in South Africa and returned to Virginia to join the CJP faculty, Juma succeeded him as MCC’s regional peace coordinator for southern Africa for three years. Today, Juma holds a PhD in politics, human rights and sustainability from Italy’s Scuola Superiore Sant’Anna and is the coordinator of peace studies and senior lecturer at St. Augustine College in Johannesburg, South Africa, where API now holds its summer training sessions. He is also API’s executive director. Juma and the Paynes will be in proximity to each other at last – 25 years after they all began their separate, but oddly overlapping, life journeys. Until then, the main connecting thread between Juma and the Paynes is me, the outgoing editor of Peacebuilder. I was able to interview Juma in South Africa on December 5, 2014, while on an around-the-world journalism expedition funded by the Paynes. With their usual farsightedness, Marian and James Payne conceived of the idea of reporting on SPI-type institutes globally. It took four writers and nine photographers to cover 12 peacebuilding initiatives on four continents and several islands during the closing months of 2014. 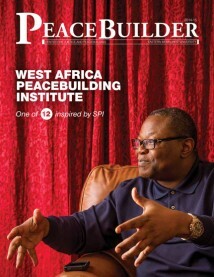 The Paynes saw this as an excellent way of documenting the impact of SPI at its 20th anniversary year. I see this mammoth project as testimony to the Paynes themselves. Likely none of this would have happened if they had not stepped forward 20 years ago with a promise to cover any shortfalls experienced by the conflict transformation program in its inaugural year at EMU. They have been devoted, generous supporters of CJP ever since. Our journalistic explorations yielded this remarkable finding: Thousands who claim EMU as their alma mater not only share the same educational DNA, they often collaborate with EMU-linked partners around the world, feeling kinship with (and deriving support from) those who speak the same language of peacebuilding and who hold the same aspirations for a peaceful world based on justice for all. In small and large ways – from improved family relationships to war-ending dialogues – they’re building a better world. * John Paul Lederach wrote that using the term “conflict transformation” implies not focusing simplistically on the resolution of a specific set of problems. Instead one’s vision is wider and longer term – to build “healthy relationships and communities, locally and globally.” It is also understood that conflict is normal in human relationships and a motor of change.